I'm missing the courtesy lights that mount under the left and right side of dash (1973 mach 1). I'm pretty certain there should be some, anyone got a picture of what they look like and where they mount? I've searched ebay/facebook/google and have not found any for sell. Any suggestions on a suitable replacement? Thanks Jeff, I searched but didn't see the thread. 1980-1986 ford trucks with the courtesy light option have a light under the dash in the same location that is very similar if not identical to the 1971 mustang light. Lots of FLM vehicles 'til the mid 80's used the same basic light. some had a 90* bend in the bracket. Hit a junkyard and scrounge around. (11-27-2018, 02:50 PM)rjpohl Wrote: I'm missing the courtesy lights that mount under the left and right side of dash (1973 mach 1). I'm pretty certain there should be some, anyone got a picture of what they look like and where they mount? I've searched ebay/facebook/google and have not found any for sell. Any suggestions on a suitable replacement? I have a pair that you can have, just pay for shipping! Thanks, please let me know how much and do you accept paypal? Not 100% sure but if your car did not have the convenience group I think it did not have the under dash lights. If it did not there probably will not be a place to plug them in. All convertibles had them since no dome light. Is the courtesy lamp wiring part of the wiring harness? My 72 Mach does not appear to have under dash lighting and I dont see a plug in the main harness either. Anyone have pics of the light installed and what the harness looks like and where it plugs in? 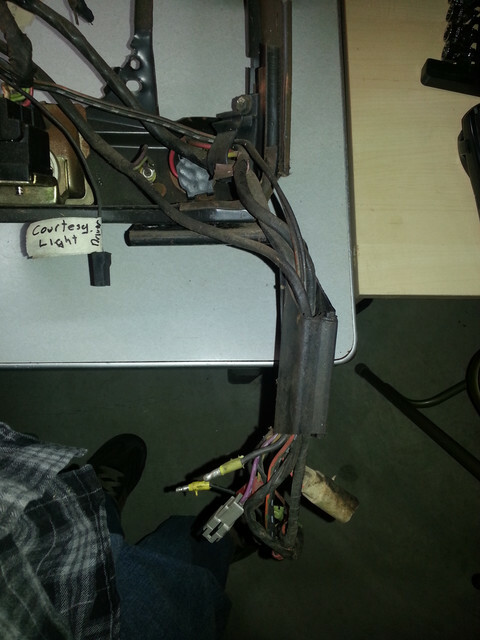 (12-04-2018, 07:33 AM)scgamecock Wrote: Is the courtesy lamp wiring part of the wiring harness? My 72 Mach does not appear to have under dash lighting and I dont see a plug in the main harness either. Anyone have pics of the light installed and what the harness looks like and where it plugs in? They were standard on convertibles, but not on coupe or fastbacks since they had a dome light. I believe they were part of the convenience group option along with the map light and automatic seat back release. This option required a different wire harness from the standard harness. I imagine you tap into the wire behind the dash for your dome light and run the wires to each courtesy light. If you need it, I could scan the electrical wiring diagram for this area.